Photographer: Luigi + Iango. Model(s): Dancer; Germain Louvet, Dancer; Hugo Marchand, Vittoria Ceretti. Source: Vogue Italia. Stylist: Patrick Mackie. Makeup: Yumi Lee. Hair: Olivier Schawalder. Vittoria Ceretti evokes a state of majestic grace in “The Confessional Dance” by Luigi & Iango for Vogue Italia, September 2017. Ballet abounds, as Vittoria holds her own among these grand, male dancers. Two, beautiful specimens appear, draped over her shoulders as if they are her sensual servants. Germain Louvet & Hugo Marchand, both Stars of the Paris Opera, dance their way through this editorial in exquisite form. A Queen of the Night, Ceretti is covered in a hooded overcoat, as she stands flanked on either side by these two comely creatures. Beautiful portrayed, her body moves like a real dancer as she ventures into the weighty world of ballet. The dancers move their limbs with such speed, their arms look like wings ready to take flight. There’s no room for ambiguity here, indifference or denial. What we have is imagery devoured by darkness and laced with light. An evocative concept. One might be intent on the idea that never the two shall meet, however, I take a more fluid approach. I believe that it is in the darkest hour that your heart can be freed. The evolution of true Wo(man) kind is captured in the phraseology of movement. Limbs stretch out in search of something substantive, while her eyes burrow into the soul. Skin to skin lets you in as the lines of the body mimic the motions of the mind. One limb reaches out to another, as connecting forces merge in artful resolution. Separate yet together, these three people move as one unit seemingly endless in their strive to survive. Willed to this wondrous page we find the absence of color to be a gift. Patrick Mackie bridges the gap between us by not moving beyond black and white. He burroughs ever deeper, letting the blood run like water vanquishing the veins. A triumph of spirit a symphony of change, here on this balletic dance floor we feel the beat of humanity deign to rearrange. Reaching through the mind we feel a vivid kind of splendor, as this piece erupts in untamed fury. Have no fear, this is a state of being. A phenomenon of underlying rage flows through the page, not to instill madness but instead to inspire fire. Forces that live below the surface, wait for their moment to arrive. Hark the herald voices sing out giving rise to the stately queen. Dark and light combine as this female embodies the dueling sides of humanity. Here we stand at the foot of yesterday’s sadness, with the will of tomorrow strong in hand. Visual art speaks as Yumi Lee uses the dancer’s face as a place to explore makeup. A cosmetic concept with no gender specification, this shift in thinking is taken from the stage. Asking that we think of this application as an extension of character, rather than a projection of pretty. Fusion forms a more fluid notion of function, allowing the notion of avant-garde excess to rise. Vittoria’s beauty is built into her being, leaving not much to be altered in the way of artificial enhancement. Darkness encircles the men’s eyes, with black shadow crawling up the brows, and encircling the lower lid. This dramatic statement is topped with a white line drawn around the orbital surround. Beauty begs to be seen with stark powder smoothing out over skin, and a tint of rose tone touching the lips. 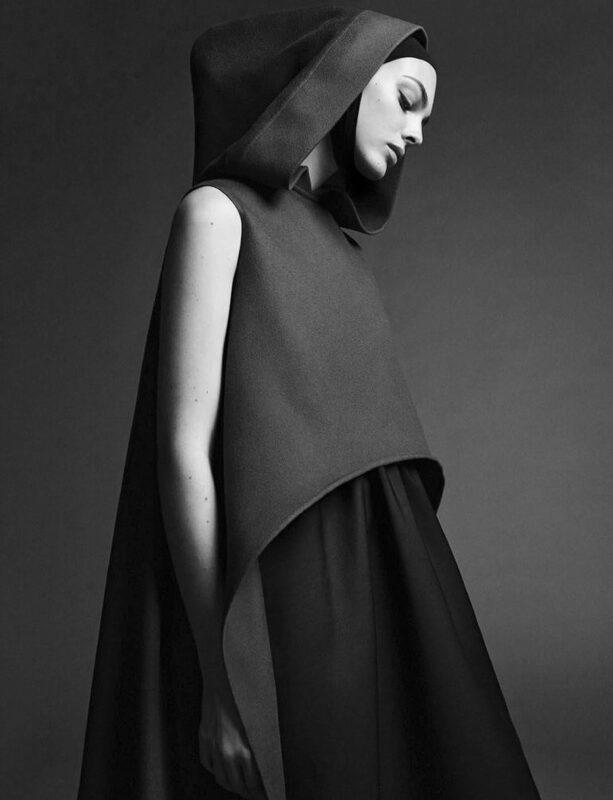 Breaking free from the chains the bind… a sartorial surprise comes in the form of Ceretti wearing a nun’s habit and hood. This editorial ends in a dramatic way, as she stands in stoic form framed by a flowing, black robe. Met with a stately surprise, a shapely pair of men’s legs come out from under her cape.